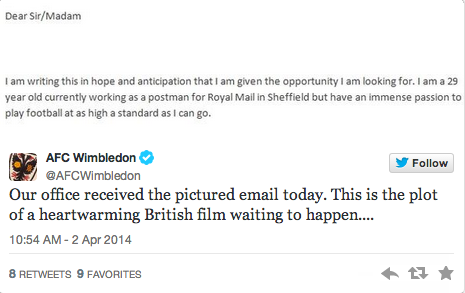 A 29-year-old postman has written to League Two side AFC Wimbledon practically suggesting they should sign him. His email can’t be seen in full as the club only Tweeted the opening paragraph, but judging by the tone of it he’s keen for them to check him out. At 29 his chances are probably fairly slim, but if you don’t ask, you don’t get! Have you known anyone to do something similar?